Though we might not understand it, the kitchen always tends to be the heart of the home. It also sees a lot of action! 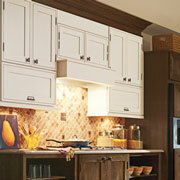 If your client wants to give the kitchen a facelift, the opportunities are thrilling and pretty much endless. The team at ProSource® of Lexington is here to provide wholesale prices and world-class expertise so that you and your client come out on the other side with fantastic results. Storage, storage, storage! 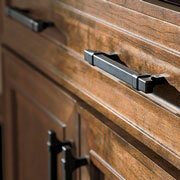 Without storage, kitchens would be chaotic, dangerous, and frustrating. However, it’s important to realize that cabinets take up so much wall space, they end up having a huge impact on the kitchen as a whole. Let our team give you and your client the exact look and materials you need. Cabinet hardware is the icing on the giant cake that is your cabinets, and it can be a traditional shine or a clever twist. It’s all up to you and your client! Let our professional designers ensure that you get gorgeous results that last a lifetime. 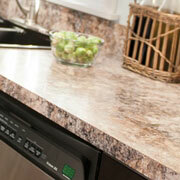 Whether they stay clear or not a majority of the time, the countertops in the kitchen are prized real estate. Make yours the best they can be with our wide variety of beautiful materials, including granite, quartz, and recycled options. If the kitchen is the heart of the home, you could say the sink is the heart of the kitchen. We get drinks from it, we wash our dishes in it, and that’s just the beginning. 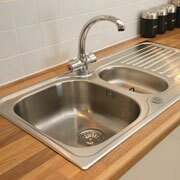 Our team can help you customize your client’s sink so it fits their exact needs, no matter how extensive they may be. Functionality and beauty must be balanced in kitchen faucets, which face the task of washing hands, filling pots, and washing dishes. 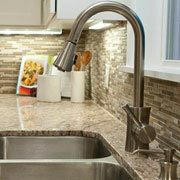 Let us customize the perfect faucet set for you and your client!